Clontarf Yacht & Boat Club : Talk - Gregor McGuckin - The Golden Globe Race. 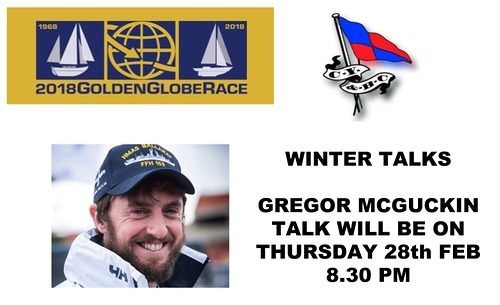 Talk - Gregor McGuckin - The Golden Globe Race. Gregor McGuckin returns to CYBC on Thursday Feb at 8.30 pm to share his experiences of the Golden Globe Race. Gregor was rescued from the Indian Ocean after his yacht was dismasted when he tried to help an injured rival Indian sailor Abhilash Tomy during the Golden Globe Race.